The Reds could have opted for a 4-man starting rotation for a while, putting off a roster cut to mid-April. Instead they named Tyler Mahle as the fifth starter and announced he would start the fifth game of the season. Mahle is holding down the spot that otherwise would have gone to Alex Wood, who will start the season on the DL with a sore back. 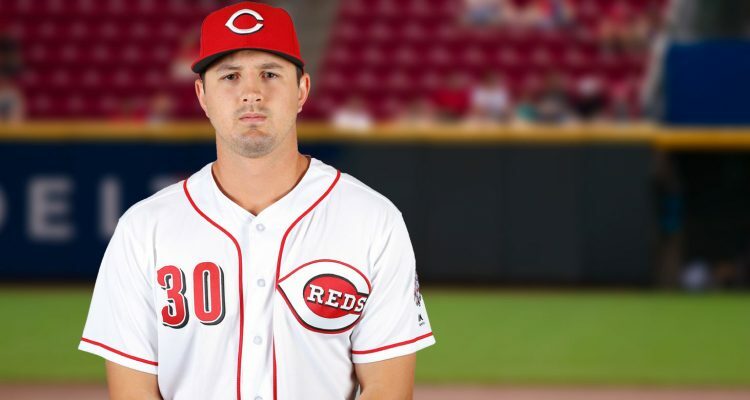 David Bell announces Tyler Mahle will be the #Reds 5th starter. Will start 5th game of season. After the earlier announced cuts, this seemed pretty obvious. So are we down to the final roster? Or are there still cuts to be made? I’ve read there are 30 players left, so 5 more cuts. I’m trying to figure that out. Siri is left. He’s the only position player I see. Bowman, Peralta, Stephens, Stephenson, Wisler and Bass? Not sure if all those guys are still on the roster, but if they are, that’s 30. This is wrong. Siri isn’t still on the major league team, although today’s Reds lineup card indicates otherwise. Stephens was cut, too. CTrent just tweeted: The two Reds bullpen spots will be contested by 5: Anthony Bass, Matt Bowman, Robert Stephenson, Matt Wisler and Wandy Peralta — Stephenson and Wilser are out of options. Bass is not on the 40-man. Ah, ok. I just saw the CTrent tweets as well. Final 2 spots still up for grabs, but I’m guessing Stephenson and Wisler will get them, unless they get traded somehow. I don’t get the rush to name Mahle as he could be optioned. BobSteve is out of options and could easily be stretched enough to give you 90 pitches in 2 weeks. They’ll be fools to waive him or make him a 1 inning guy. I see a different player this year……..he’s going to establish himself finally. I’m seeing and feeling a different vibe from the players and coaches this spring. I’ve been waiting to see more indications of real changes in the way things are done to back up all the paper changes we’ve seen. Those paper changes left a warm fuzzy feeling for the Old Cossack. As ST winds down and we see the results from the off season playing out on the field and final roster decisions being announced, that warm fuzzy is beginning to morph to a roiling turbulence with expectations building for the start of the season. DB has been extremely slow an cautious extending the starting pitchers during ST. Having Mahle as the 5th starter in the rotation from opening day may just be an extension of his ST policy, using the 4 early off days to lessen the load on the starters during the 1st 22 games before the Reds hit a 20 consecutive game streak. The injuries to the pitching staff have been more minor and fewer than in seasons past, so maybe DB’s on to something. He has time for only one more start before the end of ST but agree that Stephenson could be the man this year. I would not mind seeing him go 4 innings next Wednesday and then follow Mahle on his day to start. No shock there, but the Reds don’t need Mahle much if they skip him on off days. Still a reasonable choice and this gives the Reds a chance to see how he’s evolved under the (brief) tutelage of Johnson, Cotham and Bell. It’s possible but not obvious that Reed would be better right now, and he hasn’t been stretched out to start yet. He’s the only other clearly good option – Romano, Stephenson and Wisler haven’t yet shown that they deserve any starts in Cincinnati. Mahle was great in 2017. And in 2018 from April 18 thru July 6 Mahle was very good. As a 23 year old he only allowed a 3.28 ERA with more K’s than IP’s. Although he had a rough stretch of 4 starts after that which skewed his #’s. But he’s been good at each minor league level and there’s no reason Mahle shouldn’t be starting in the majors. There may be, but Mahle will get the chance to state his own claim to one of the five available starting pithing positions this spring.